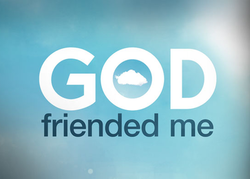 Judy and I recently started watching a new TV show called God Friended Me, the premise of which is an atheist podcaster gets a friend request from “God” on Facebook. After that “God” sends him friend suggestions and each one turns into some sort of dilemma that Miles (the main character) must solve. Its a really interesting premise and a very brave leap by CBS because like the show Manifest on NBC, they’re reintroducing religion to the mainstream media, something that has been avoided so as to be “politically correct.” Miles and his friends, while helping the people that “God” suggests, are also attempting to track down the owner of the “God account” and to try and determine why they’re being used. We obviously can never find out who the real person or entity is behind the God account because that would kill the whole show. We’re left to believe that it is God Himself who is reaching out to Miles in an attempt to bring him back into His fold. Miles is forever skeptical over the ownership of the account because he doesn’t believe in God! As I’ve told you before, a Bible was put into my hands by God, and His work of bringing me back into His fold had begun. (See My Journey Begins) God friended me, or refriended me, or something, but God wanted to spend time with me, and I wanted to spend time with Him. We have hundreds of friends on social media platforms like Facebook, Twitter, Instagram, Snapchat, etc, but how many of them are your real friends and how many of them really care about you? How many would do everything in their power to make your life right? Only God can and will do that. He has done it for many people throughout history. When Adam and Eve sinned in the Garden of Eden, He didn’t abandon them completely. When the Israelites disobeyed His commandments, He didn’t abandon them completely either. He gives us chances to make mistakes and correct them, and is there when we need Him the most. When we begin to fail, is the time that He really shows us His power. When I became a Christian in jail, it was noticed almost immediately, and other inmates would approach me with questions or for help in things. I enjoyed being that person. When I was released, I was unsure how people would react to my open Christianity, so I wasn’t fully open at first. But now I wear it openly and proudly, and people have to accept that. I am happy every day that God friended me. No He hasn’t added me on Facebook, like in the TV show, but I know that He is there for me when I need Him. I am thankful for Him throughout the day, when things go well and I call upon Him when I struggle. God is my friend, and He can be your friend too! Just ask Him. Now that you’ve enjoyed this page, why don’t you check out the free resources page? No obligation. From Daniel: Nebuchadnezzar’s dream, four great beasts and a little horn, the ram and the goat, the Messiah appears. From Revelation: Letters to the seven churches, seven seals opened, seven trumpets, the great red dragon, seven-headed leopard beast, the three angels’ messages, the seven last plagues, the great whore Babylon, victory over Satan, Satan bound for 1,000 years, the New Earth.